If Steve Rogers is no longer to fill the role of Captain America, then someone must step up and take his place, and Marvel thinks it has found the right man for the job. Hot on the heels of introducing a new Thor this week, Marvel has taken the wraps off a mystery everyone knew was coming: Who would be the new Captain America. Having been stripped of his strength and vitality, Steve Rogers has to step down as Captain America, but he still feels that someone should step up into that mantle. 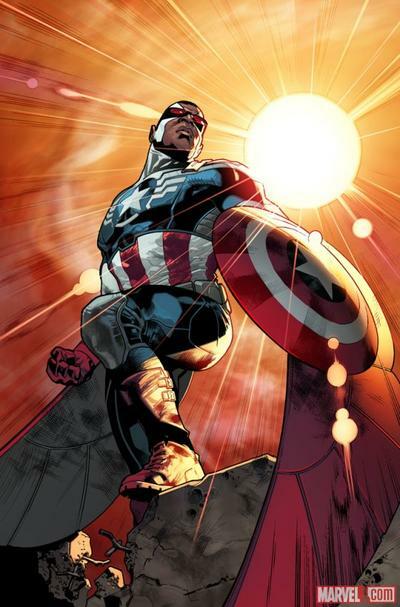 With that in mind he turns to one of his closest allies, Sam Wilson, also known as The Falcon. Sam Wilson isn’t the first character to take up the mantle of Captain America in the absence of Rogers. Through out the years he was replaced by John Walker (who eventually went insane) and more recently by Bucky Barnes, also known as the Winter Soldier. As with the news of a new Thor, my guess is this will be a fairly short-lived storyline. With Avengers: Age of Ultron hitting theaters in the U.S. next May, Marvel will want to have Steve Rogers front and center somewhere for those that go from the movie theater to a comic shop. That being said, however, Wilson is a perfectly logical choice to fill Cap’s boots. Sam Wilson makes his debut as Captain America in All-New Captain America #1.